I have to admit I really like the hero’s name: Hugh Brennan. It reminds me of the name of the sheriff on the BBC series Cadfael, a character I always liked. I didn’t note any special reason for the name or connection to the story’s theme, but a good, pronounceable name is always a good thing in a book. Right? The heroine’s name, however, does fit well with the story. Julia Grace, widowed ranch owner, shows grace and mercy to the tired drifter (the handsome Hugh Brennan, of course) by giving him a food and a job when she could have sent him away in the interest of personal safety—she had no reason to trust him then. The surname name Grace fits her well, though it was tarnished by her controlling, brutish husband. Betrayal is an apt title for the book, as it is something both Julia and Hugh know well. Betrayal, pain, and the love of God. Julia, now free from her husband’s abuse, wants only the solitude of her Wyoming ranch. Hugh, recently free from years of imprisonment for a crime his own father committed, wants to find his sisters in Idaho. But, as Providence would have it, Hugh’s horse goes lame while crossing Julia’s property. She needs help on the ranch, he needs a place to stay while his horse rests, so they strike a deal—he’ll stay for a few weeks and then help her drive her cattle to a buyer. Of course, you know what happens then: they gradually fall in love but don’t want to admit it because of their hurt and broken pasts, there’s trouble (in the form of a conniving, land greedy former brother-in-law) that threatens to drive them apart when they begin to think there might be hope, and, after all that, a confession of love, and a happy ending. I won’t tell you how it happens, that would be a spoiler, but it does happen, and I enjoyed finding out how it came about. -I like stories of wounded hearts being healed, so that’s a plus. -Encouraging spiritually with reminders of God’s love for each of us, of our status as new creations, and of hope for the future. -Likeable, admirable main characters. I always prefer heroes/heroines I can respect. -Is part of Where the Heart Lives series, but stands alone. -The frequent switching from Hugh’s to Julia’s point of view was distracting. I’d prefer longer sections from each of them. -There were too many hints from the author that they were falling in love. A few less “why should I care about her/him?” and “why was she comforted by his presence?” type of questions and comments would have improved it. -A few less comments on how in love Rose and Peter were (there were a few sections from their points-of-view as well) would be an improvement as well. We readers get the idea. Overall opinion: Cute, inspirational romance. I read and enjoyed the previous novel (Belonging) and look forward to the next one. These books are about Hugh’s sisters, from whom he was separated as child. Confession: I received this book, and the previous book in the series, from Zondervan Publishing in exchange for a review. However, I’ve striven to give an honest review. Zondervan kindly sent along an extra of the books as a gift for my blog readers. 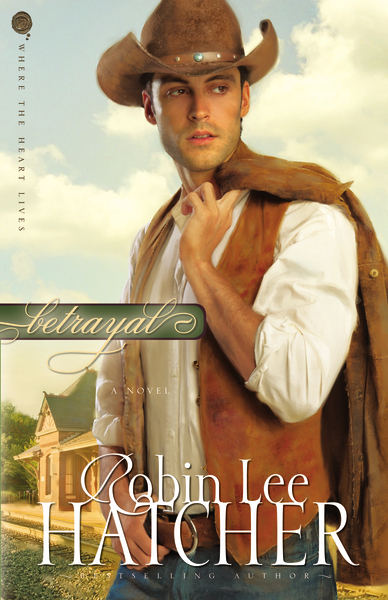 For a chance to win a copy of Robin Lee Hatcher’s books Belonging and Betrayal, please leave a comment about why you’d like to win the books, or in keeping with the month’s Western theme, tell me your favorite Western. A name will be drawn randomly for the prize. To have your name in the hat more than once, subscribe to the blog and tell me you did (or already have) in the comment. The winner’s name will be announced next week.